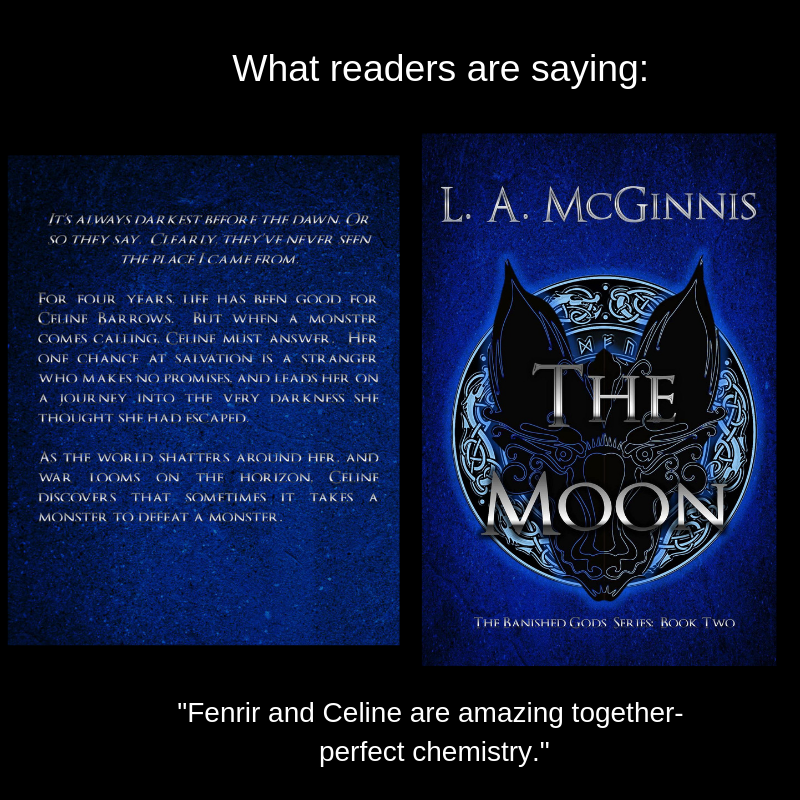 I am so excited to introduce you to two new characters- Celine Barrows and Fenrir- the main protagonists of The Moon, book two in the Banished Gods Series. I’ve been working on these books for so long, and I can’t believe today is the day I get to show this book to the world. It might be my favorite love story EVER!!! Celine Barrows has spent four long years rebuilding her life after an abusive childhood. Fenrir has endured an eternity alone. Together, can they build a future? When Fenrir showed Celine the bathroom she thought, for reals, this is a total joke. I mean, she figured, nobody has a bathroom this big, right? It was a tiled homage to Roman decadence, with multiple jets, two soaking tubs and heated floors that practically made her weep after being stuck outside all day in the freezing cold of Chicago. Lined up in front of her was a veritable mother load of high end toiletries, the kind she’d never buy herself, the kind she coveted at the store before picking out the cheapest Suave on sale. “Take your time.” Fen’s deep voice growled from the door behind her. “I’m going to line us up some food. Which might take me awhile, so don’t rush on my account.” As he turned to leave, the look he raked her with, a delicious, measuring head to toe scan, left her all wobbly and wet. While she wondered, not for the first time, what in the holy hell she was doing up here. Immortal gods. The end of the world. Not that these matters couldn’t wait though, while she took a very long, very hot bath. The warm water seeped into her still-chilled skin. Sinking into her as the questions whirled round and round in her head. The stone was a key. But she was the portal the dark god would use to cross over. Dredging up something resembling strength, she thought back over these past months, searching for something, anything that might offer a clue, an answer. A way out of her dilemma before it was too late. And found nothing. Leaning back in the tub, despair took over completely, and her tears mixed with the soap as steam welled up, obscuring everything around her. If only she could hide from the future as easily. Morgane leaned against the window, watching the creatures of the night. The whores and the vagrants and the drunks and the demons feeding upon them all. She once speculated what it might feel like to look down upon all the world and wonder how it had all gone so wrong. She may have dipped her toes in the waters of the supernatural, coming here to kill the monsters for revenge, but now? She was drowning under miles of the unknown. 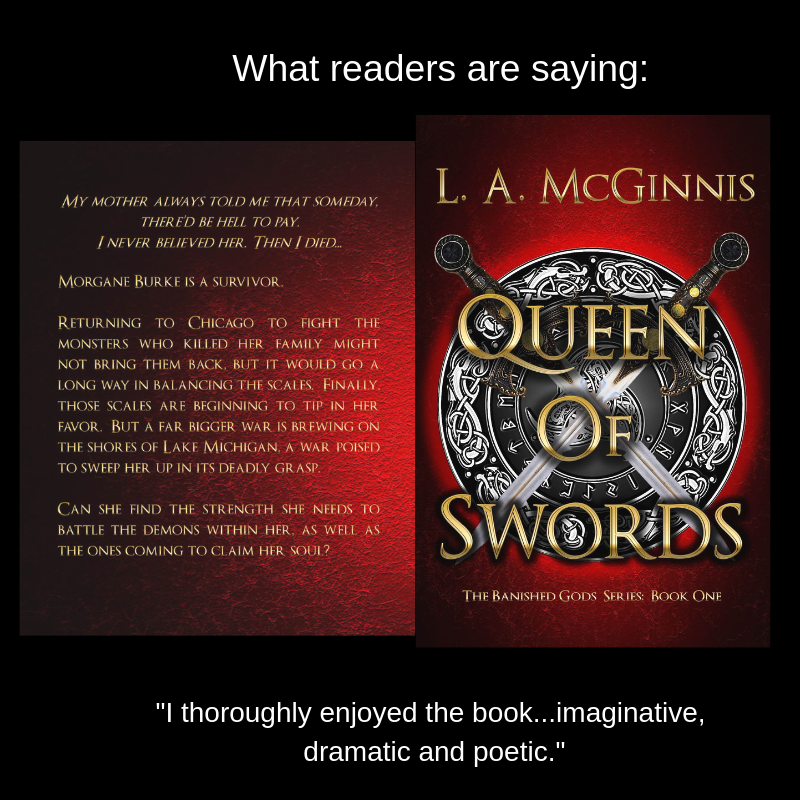 A bone deep shudder shook Morgane. Only one name came to mind, as she remembered that perfectly corrupt face. The Goddess of Death had come to call. Logan grew up knowing life wasn’t really a fairy tale. Her world was dark, even cruel. While other little girls dreamed of castles and princesses, Logan wished for just one place to call home. So when the fairy tale literally fell into her lap, and everything she’d ever dreamed of seemed close enough to touch, it came as no real surprise to watch it all slip away. But occasionally, love springs from the darkness, friendships are forged from the dust, and family can be found in the most unlikely of places. The dream might not always be made of moonbeams and stars, but sometimes it’s enough to know it’s yours. 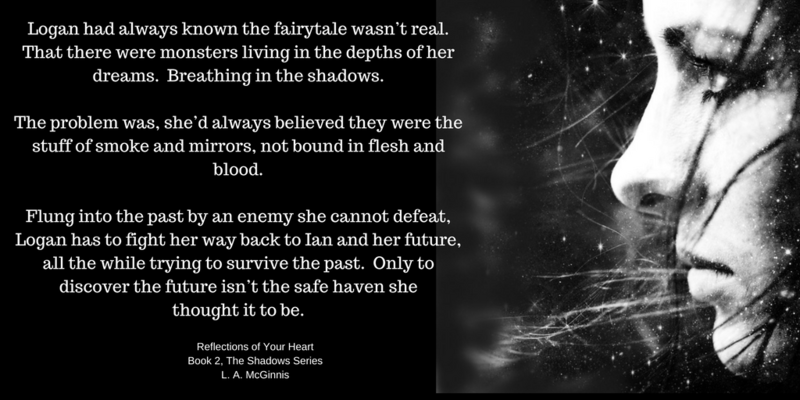 Reflections of Your Heart- coming mid-2019! 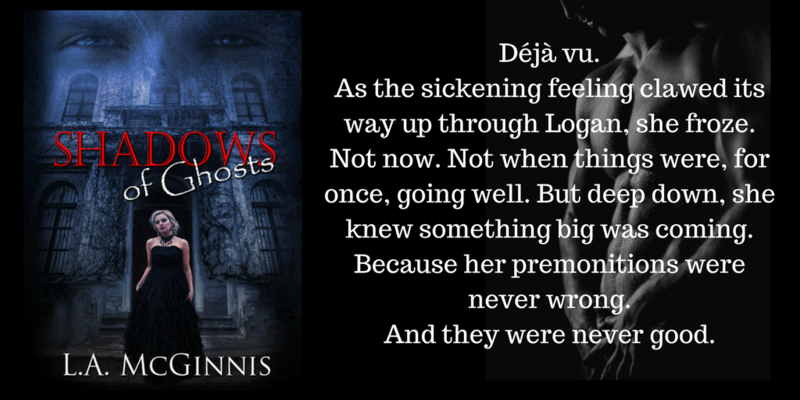 I can’t wait for you to read this second installment in the Shadows Series! There are lots of interesting developments in Logan and Ian’s relationship, You get to meet nathan De Forest, our new villain, and a secondary love story that I really hope you’ll enjoy. -L.A.